Screen grab of CCTV footage supplied by ACT Policing. 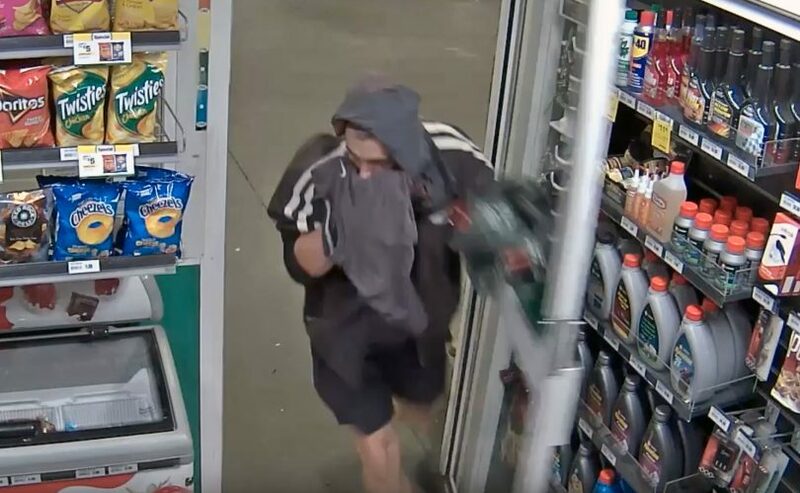 ACT Policing has released CCTV footage of a man who robbed the Caltex petrol station in Mawson at knifepoint earlier this year. Around 9:20 pm on Friday, 23 February 2018, a man entered the petrol station on Mawson Place, armed with a knife, and demanded cash. The man is described as being Caucasian in appearance, about 180cm (6’) tall, with an average build, short brown hair and brown eyes. His face was partially covered with a piece of clothing. He was last seen leaving the area in a white Ford Fiesta. Police are urging anyone who knows this man or may have any information that could assist police to contact Crime Stoppers on 1800 333 000, or via the Crime Stoppers ACT website. Please quote reference 6237477. Information can be provided anonymously.